The Duck is an analog synthesizer built between 1981 and 1986 in Commack, NY. 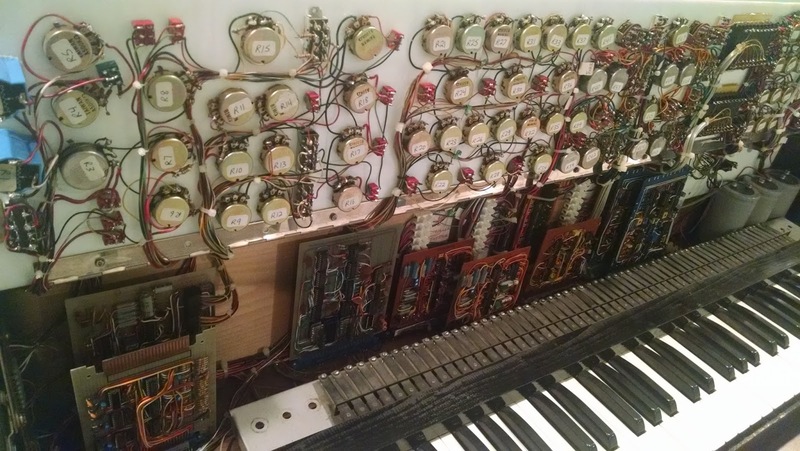 Keyboards were not easy to come by as electric components. This keyboard was the manual from a Conn electric organ recovered from a fire and found in the rafters of a pipe and reed organ manufacturer in Hicksville, NY. The keyboard scanner is built from discreet logic producing a monophonic last-note-played algorithm. The circuits were all hand-wired on prototype boards. The sound-producing technology is primarily based on a suite of chips manufactured by Solid State Micro Technology (SSMT). The Duck was sitting in a unheated warehouse in Albany, NY for many years. 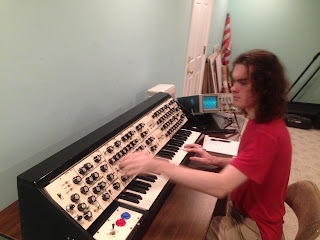 It's now in Milford, MA, somewhat reconditioned, almost all keys are playable, and most of the sound-producing circuitry is working, although in a very temperamental state since many of the solder joints and switches and potentiometers were degraded through the years. What does it sound like? In 1986 over two weeks I created these fragments. The equipment stack included the Duck, Ensoniq Mirage, Roland (I think Juno-60) and a drum machine. Mixed on a Peavey board directly to cassette tape. First Performer on the Duck - Sam McArthur having a great time! August 2015. What a great evening! Thanks for demonstrating and explaining the wave forms and giving me a chance to hear Sam play the Duck.